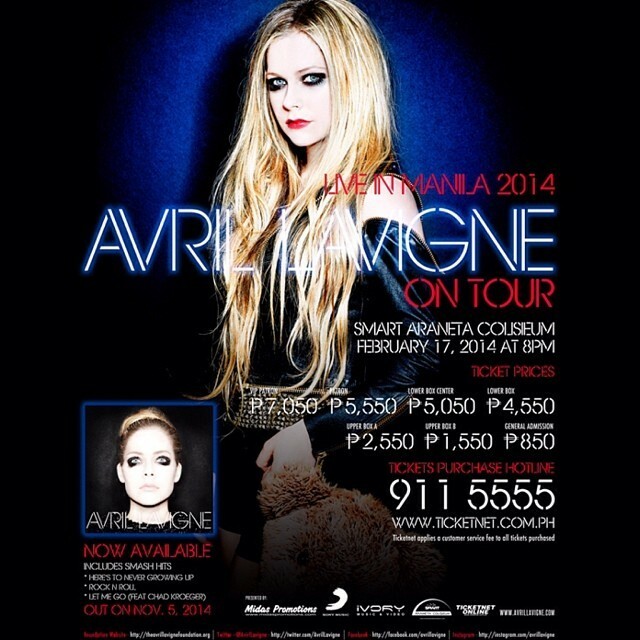 Wanna see Avril Lavigne’s concert on Feburary 17, 2014 at the Smart Araneta Coliseum but your pocket says you have you to prioritize your beauty care? Well, Proactiv, the leading provider of anti-acne solutions, has something for you that will hit two birds with one stone. You can go and see the concert to have a glimpse of Lavigne's gothic looks and rock music without spending for your ticket. All you need to do is to purchase Proactiv 30-Day or 60-Day kits to get a chance to win a Patron Ticket to the Canadian singer’s concert. You heard it, a patron ticket! 1. Buy a Proactiv Solution 30-day kit (Php 2,495) or 60-day (Php 3,995) kit from any of the participating outlets within promo period. Purchase of 30-day kit is equivalent to 1 raffle entry, while purchase of 60-day kit is equivalent to 2 raffle entries. 2. For customers ordering from my.proactiv.com.ph, there is no special instruction or forms to be filled out. The system automatically tags eligible customers and the Account Name will be used as official entry. The promo can be viewed here. 3. For customers ordering via phone hotlines, our Customer Service Representatives shall automatically tag all eligible customers and your Account Name in our database will be used as official entry. 4. For customers ordering from Proactiv Mall Kiosks our friendly Sales Personnel will assist you and help you fill-out Official Raffle Entry Forms available on site. 1. Purchases outside the promo period or from non-participating outlets are not eligible to join the raffle. 2. If a customer avails of the Proactiv Money back Guarantee that comes with every Proactiv 30-day or 60-day kit, this forfeits the subsequent activation of the raffle entry. If the customer won and subsequently availed of the Money Back Guarantee after claiming the prize, the actual cost of ticket will be deducted to the refund value. Winners- you can be one of them- will be contacted directly by a Proactiv representative for instructions on claiming the prizes. The prizes are directly purchased from Ticketnet, the official ticketing agent of the concert. Proactiv Solution is not a sponsor or an endorser of the event. It just wants you to be happy and beautiful when your favorite singer comes to the Philippines! DOH–FDA CDRR Promo Permit No. 221 series of 2013.